Each year we like to revisit the topic of choosing the best Asterisk® platform for deployment in the home and small business environment. No solution is obviously right for everybody. But we think it’s important to sketch out the relevant factors that need careful evaluation before you begin the installation process. Our focus today is open source, GPL platforms with Asterisk for home or SOHO deployments. That excludes a broad swath of equally capable commercial or proprietary alternatives including ThirdLane, Switchvox, and FreePBX® Distro as well as many unified communications solutions that do not rely upon the Asterisk telephony engine including FreeSWITCH, ShoreTel, Cisco, 3CX, and many others. If your requirements exceed telephony support for more than a few dozen employees, our recommendation is to hire a consultant that can assist you in that decision-making process. When It Comes to Hardware, Size Matters! Even in the telephony world, it’s true. Size Matters! Choosing an Asterisk platform for your home and choosing a telephony platform for a call center are very different beasts. Our traditional recommendation for home and SOHO deployments was to go with dedicated hardware with an appropriately sized Atom processor, RAM, and hard drive. In the words of Bob Dylan, "The Times They Are A Changin’." With the nosedive in Cloud processing costs and the emergence of powerful desktop virtual machine platforms, that may no longer be the smartest solution. First, it puts you in the hardware business which means you’ll have to deal with hardware failures and backups and redundancy. Second, depending upon where you live, it may not be cost-effective to maintain your own server. Electricity and Internet connectivity cost real money above and beyond hardware costs. For home or SOHO deployments, it also depends upon what other computers already are in use around your house or office. For example, if you have a $2,000 iMac with a $100 backup drive running Carbon Copy Cloner each night, then you’ve already got a fully redundant server platform in place. You really don’t need a dedicated server for telephony to support a handful of telephones. VirtualBox® running any of the Incredible PBX™ solutions is free, and it’s fully capable of meeting your telephony requirements with no additional hardware investment.1 If your iMac’s main drive crashes, you can reboot from the attached USB backup drive with a single keystroke and never miss a beat. For those dead set on running dedicated hardware for your home or SOHO telephone system, there’s really no reason to spend more than $35 for a Raspberry Pi®. With its new quad-core processor and gig of RAM, it can meet or exceed any requirements you may have. Buy a second microSD card for redundancy and call it day as far as hardware is concerned. If you’d prefer to separate your telephone system from your house or small office, a Cloud-based setup may be a better fit. Our Platinum sponsor, RentPBX,2 offers a worldwide collection of servers and will host your Asterisk-based PBX for $15 a month (Coupon Code: NOGOTCHAS) on a platform that rarely, if ever, goes down. If you like to tinker but also prefer a Cloud solution, consider Digital Ocean ($5 a month for a virtual machine) or Vultr ($2.50 a month) or HiFormance ($13/year). All four support Nerd Vittles with referral revenue which helps us keep the lights on. 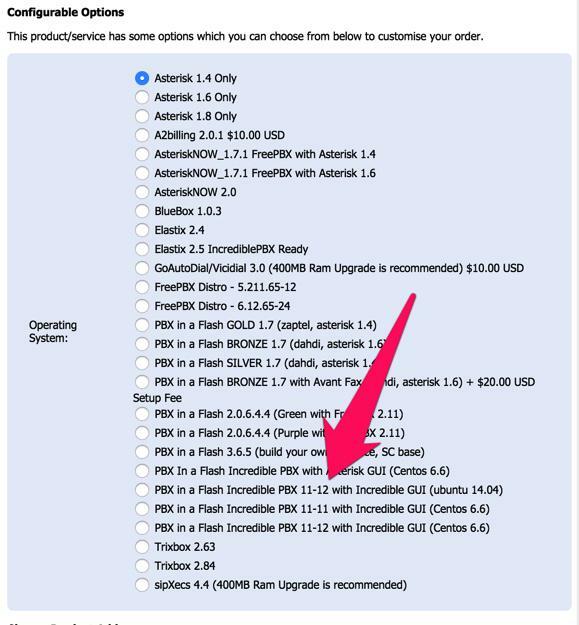 NEWS FLASH: RentPBX now offers all of the new Incredible PBX builds with the Incredible PBX GUI. Tutorials available here: CentOS platform or Ubuntu platform. Use the NOGOTCHAS coupon code for $15/mo. pricing. That’s our latest take on SOHO hardware. If you have additional questions or concerns, come join the PIAF Forum and take advantage of our hundreds of gurus who will give you all of the free advice you could ever want. I’ve Got My Hardware Platform. Now What? The next step is choosing an Asterisk telephony platform. That used to be easy. There was Plain Ol’ Asterisk if you were a guru or there was Asterisk@Home if you wanted a GUI to guide you through the telephony maze. Now it’s more complicated. There are a number of different Linux platforms. There are a number of different Asterisk versions. And there are a number of different GUIs that support Asterisk. So let’s work our way down the list starting with the Linux platform. The gold standard for Asterisk servers has always been CentOS, a GPL clone of RedHat Enterprise Linux. It, too, is now owned by Red Hat. The old adage was that nobody ever got fired for recommending IBM. In the Asterisk community, that remains true with CentOS. Unfortunately, CentOS now comes in several flavors. There’s CentOS 6 or CentOS 7 which is a very different beast. For Asterisk deployments, you can’t go wrong with CentOS 6. It works well on the latest dedicated hardware and is supported on all virtual machine platforms. As with choosing a language, you now have a choice of Linux platforms. There’s RedHat/CentOS, or Debian, or Ubuntu, or even Raspbian for the Raspberry Pi hardware. Unfortunately, the RedHat-CentOS and Debian-Ubuntu-Raspbian platforms have completely different languages, much like French and Spanish. The Linux packages that are included in the platforms also have different names. If you’re a Linux aficionado and you already have a favorite, stick with what you love. If you’re planning to deploy a Raspberry Pi, stick with Raspbian. For everyone else, CentOS 6 still is your best bet for now. Believe it or not, there are many organizations still running their telephone systems using Asterisk 1.4 or 1.8 even though Digium support for those platforms ended years ago. In the commercial world, it is not uncommon to see telephone systems that are more than a decade old. With Asterisk, things are quite different. There’s a new version every year. Fortunately, Digium has adopted a new support philosophy and every other release (more or less) now is anointed with the LTS (Long Term Support) moniker. An LTS release gets four years of bug fixes and five years of security updates as opposed to the other releases that come with one year of bug fixes and two years of security updates. It’s still not 10 years, but it’s certainly better than wrestling with Asterisk updates annually. We think there remains a need to reconsider these timetables. New updates have become so complex that the releases typically are almost two years into their life cycle before there is anyone that treats the releases as anything more than experimental. This was especially true of Asterisk 12 which was a terrific new product that provided dramatic improvements particularly in the SIP area. Unfortunately, it reached end-of-life status before most folks even had an opportunity to use it. Our recommendation remains Asterisk 13 which is an LTS version that’s rock-solid. Most of the GUIs for Asterisk have one primary purpose. They are code generators for the Asterisk telephony engine, nothing more. With each of them, you can turn off your web server after using the graphical user interface, and your phone system will continue to work as designed. The exception to that is Wazo which is an awesome real-time implementation of Asterisk. The only drawback is its steep learning curve. In the top right sidebar of Nerd Vittles, you’ll find a colorful list of all the Asterisk distributions we support. The good news for you is they’re all free. So take a little time and load up several of them. Kick the tires until you find one that is easy for you to deploy. Our personal favorite remains Incredible PBX® 13-13, but you can’t go wrong with Issabel® or Wazo. Rome wasn’t built in a day so don’t expect to master Asterisk in a couple of hours. We’ve been at it for ten years and still learn something new almost every day. And that’s the fun of it. Now that you have the background, we also wanted to provide a simple Decision Tree tool that will guide you through choosing the Asterisk GPL aggregation that best meets your needs. After you’ve made your selections, the utility will point you to the tutorials that will walk you through downloading, installing, and using the platform of your choice. Just click here to get started. Enjoy! whats most worse is that debian 32 bit platform is not recognised.